Cheshire based solicitors Bott and Co have released an interactive tool to delight food lovers. 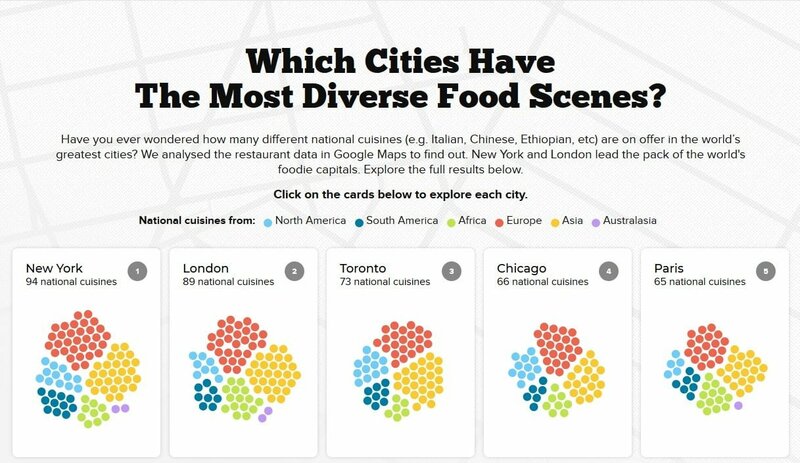 It shows which cities have the best and most diverse foodie scenes. Top of the foodie list is New York, closely followed by London but locations like Dubai and Melbourne are in there too. Bott and Co decided to take a look at large cities around the world and find out what different national cuisines they were able to offer. What they came up with is a list of the most diverse locations for those who want variety in their culinary experience. All you need to do is click on the link for each city and you’ll get a detailed map with colour coded dots for every restaurant. New York, for example, hits the top of the list with 94 different nationalities represented in their foodie scene, with everything from North American and European cuisine to Asian and African represented. Put your cursor over a dot and you can easily see the listing for the restaurant on Google Maps, where to find it and what kind of food is on offer. Next on the list is London with a mix of 89 different nationalities giving you the chance to enjoy the Swedish Aquavlt in St Jame’s or Pakastani cuisine at the Lahore Central on Richmond Road to name just a few. There are some less prominent cities that you might not realise have a broad range of culinary delights on offer. Toronto is at number 3 on the list and Dubai makes it into the top ten – a reflection of its growing status as a cosmopolitan region that caters to a wide range of nationalities. Of course, Paris finds itself high up the list with 65 different national cuisines represented. This is one of the first interactive tools of its kind that allows you to quickly identify different food nationalities on a map. All you need to do is select your city, check out the colour coding and click on the dot of your choice. It’s linked to Google Maps so you quickly get address details and customer ratings and as well as more information about each individual restaurant, including the type of food that’s on offer. You can find out all about the top 50 cities with the best foodie scenes on the Bott and Co website.